We are starting the Initial Public Offering (IPO) of stock for SmartBots at SLCAPEX marketplace. 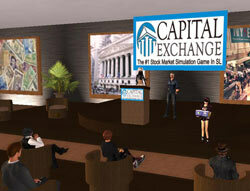 The IPO starts Wednesday, Oct 26, 4:00 AM SLT. SmartBots services are up and running for almost two years (since January 2009). This is successful and developing SL company: the monthly revenue is L$360,000 with thousands of customers. We release the new tools and devices to manage Second Life groups and Second Life bots.